Bronx REACH CHAMPS aims to improve access to parks and open spaces for physical activity opportunities. In collaboration with Bronx Community Health Network and New Yorkers for Parks, Bronx REACH CHAMPS is creating easy to use guides to obtain park permits to Bronx parks for safe group physical activity and social engagements. 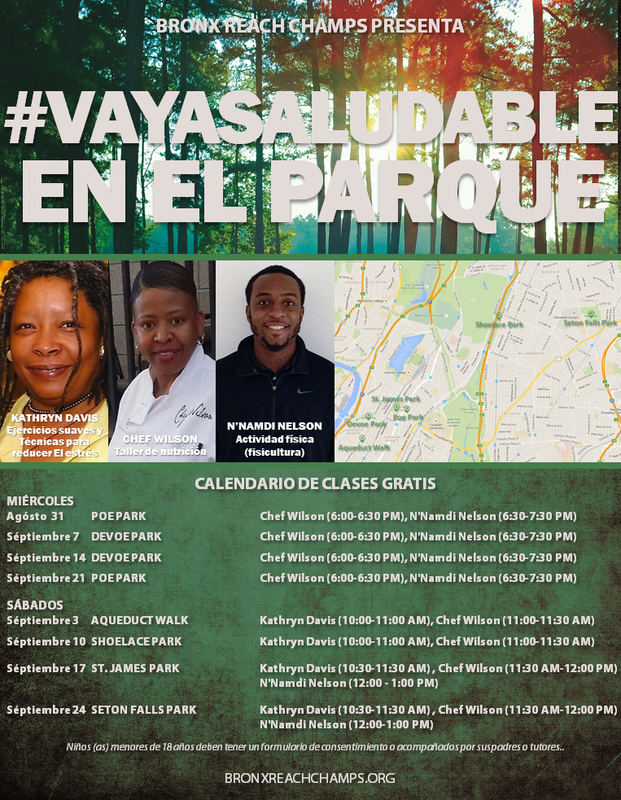 In addition, the Bronx REACH CHAMPS Parks and Open Spaces Coalition--made up of nearly 40 local organizations--launched a program block of exercise and meditation classes in July that rotated throughout 5 Bronx parks. 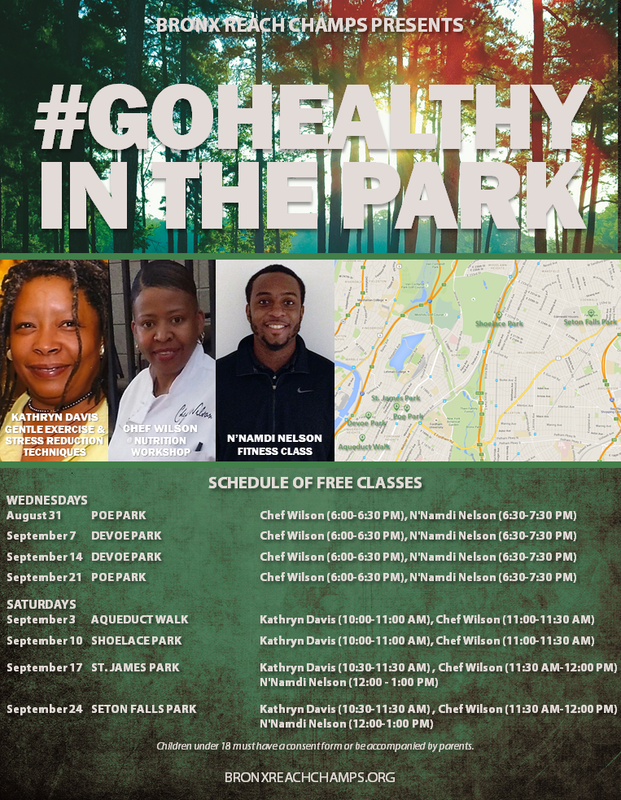 The second round of programming, which includes a nutrition workshop, will kick off August 31 and include all 6 parks in the program (Aqueduct Walk, Devoe Park, Poe Park, Seton Falls Park, Shoelace Park, St. James Park). Children under 18 must have a consent form or be accompanied by parents. Bronx REACH CHAMPS aims to reduce obesity and improve the overall health and wellness of the Bronx’s culturally and ethnically diverse population. Good nutrition and physical activity are powerful tools that foster good health, academic success, and help improve the quality of life at all ages. Bronx REACH CHAMPS coalition partners include Bronx Community Health Network; Acacia Network/ Promesa; Albert Einstein College of Medicine; NYC Health + Hospitals, Gotham Health-Segundo Ruiz Belvis; Montefiore Office of Community and Population Health; Montefiore School of Health Program; and The Bronx Health Link. The Racial and Ethnic Approaches to Community Health (REACH) is made possible with funding from the Centers for Disease Control and Prevention. Qigong Meditation is a fun and easy mind-body practice that helps to reduce accumulated stress at the same time that it helps to build physical energy and vitality. The sessions are guided so it is easy to follow along. The practice includes breathing and visualization techniques in combination with the meditation practice, which can be done while sitting, standing or moving. The moving meditations are slow graceful movements that resembles Tai-Chi. Kathryn Davis is a teacher of meditation, movement and relaxation techniques, a Spiritual Doula and Energy Healing Practitioner. She is certified as a Qigong teacher and in Qigong healing techniques from OCOM, the Oregon College of Oriental Medicine, is a practitioner of Reiki, spiritually guided life force energy and The Sandlin Technique, a form of Indigenous energy/body work based on Vision Quest and Shamanic Insight. Kathryn is a host and producer of Health Action and Heart Of Mind, heard over WBAI Pacifica Radio, 99.5 FM and the Progressive Radio Network, PRN.FM. The Nutrition Workshop will feature healthy eating education and demonstrations. Chef Geneva Wilson, owner of Ms. Geneva's 50/50 LLC, is a firm believer that foods are an integral part of healthcare and has built her business on that very premise. She teaches people, both young and old, that the right foods can make all the difference in the world when it comes to one’s health. She teaches out of MS 391. Her program instructs kids and their parents on eating the right foods and often introduces her audiences to foods they are convinced could not taste good. One of the biggest misconceptions she encounters about healthy foods is “if it’s healthy, it doesn’t taste good.” . She serves as the go-to chef for the Bronx REACH CHAMPS programs, partnering with Bronx Community Health Network. The Physical Fitness Class will include a combination of strength and aerobics activity. N'Namdi Nelson began his career with an internship at Lee Taft Sports Academy more than a decade ago. Following LTSA he worked at Velocity sports performance as a sports performance coach. During his time there he became a senior sports performance coach and the interim director of sports performance before moving on to Fordham Prep High school. At Fordham Prep he was the head strength & conditioning coach before resigning in 2014 to finish his M.B.A. During his time at Fordham he also was the assistant manager to a private gym on the upper west-side of NYC. N’Namdi’s specialty is weight management and sports performance/athlete development which he works with clients of all ages. He also attends seminars/conferences to stay updated in the latest training methodologies. “Nothing motivates me more than seeing my clients reach their goals/and or full athletic potential”. Train: # 4 train to Fordham Road/Jerome Avenue. Walk ½ mile east to the park. Train: #2 Train to Gunhill Road. Walk 0.1 mile to park. Bus: Bx 41. OR D Train to 205 Street-Norwood Ave. Walk 1 mile to park, near Woodlawn Cemetery.